Looking for cheap canvas prints with a high quality look? Print your favorite photos on our Canvas Lites and enjoy elegant canvas that won’t break the bank. All Canvas Lite sizes include a easel on the back for easy display on your favorite bookshelf, counter top or bedroom night stand. Order a 4×6 canvas print of your favorite pet photo or a 9×9 of your best Instagram picture! Our Canvas Lites are ideal for bringing to life any photo from your collection. Looking for custom mini canvas prints to show off on a side table or fill in an empty spot on your bookshelf? Our 4×6 canvas photo prints are a great way to preserve a favorite memory. In addition to turning your favorite photo into decor, you can order wallet size photos or 4×6 prints to share your photographic treasures with friends or add to your family album! If you’re looking for larger sizes, we also offer an easel back canvas in an 11×14! It features gallery wrapped edges and can be displayed on both walls and flat surfaces. We also offer additional sizes as well, that are sure to fit perfectly with your current decor. Need a canvas print for your wall instead? Our floating canvas prints and wrapped canvas wall art option are ideal for updating any room with a bright, colorful statement! Once you have chosen your photo, simply upload it to MyPix2 to get started. Within minutes, you can design your very own photo canvas to display your most cherished memories. MyPix2 Canvas Lites are perfect for dressing up any drab area around your home with color and personality. First, select your canvas size and then choose either a horizontal or vertical layout to display your picture. Afterwards, you may upload the photo from your computer or smart phone. Once your canvas opens in the project builder, simply drag and drop your photo onto your canvas and position it to your liking. After you have finished customizing your canvas, add it to your cart and place your order. Our Canvas Lites include an easel so they are easy to display on virtually any flat surface. Your photos will look great printed on quality canvas and are sure to brighten up your home décor no matter your style. 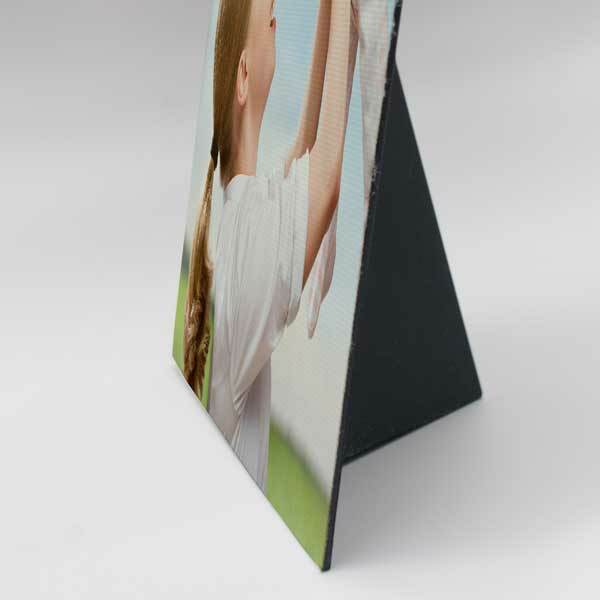 Our Canvas Lite prints can be stood on any flat surface with the included easel. With its compact, flexible construction, our Canvas Lites can be displayed in a snap and are a great way to show off your most cherished memories. Perhaps, you have a bookcase in your living room with a variety of décor accents displayed on each shelf. Why not display your best wedding photo on your bookcase shelf to liven up the look of your living room. Choose from several Canvas Lite sizes to fit your shelf and your digital image to a “T”. Maybe your bedside table is looking a little empty and you’ve been searching for a unique décor accessory to spruce up your bedroom. 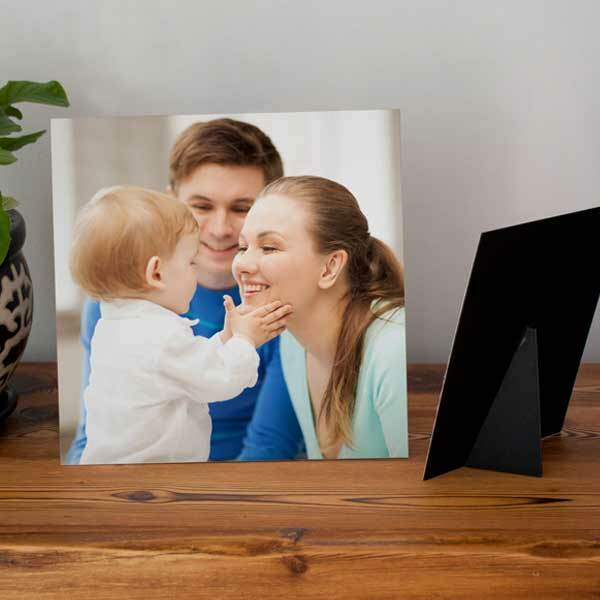 Create a Canvas Lite and showcase a fun snapshot of your family to wake up to a cherished memory each day. You can pick from several canvas dimensions to fit your table top and display your family photo in a whole new light. With multiple customized options to select from, you can easily design your own photo canvas to preserve your photos in style. With our Canvas Lites, you can create your own Instagram photo print on canvas. We offer three square canvas sizes which can be displayed on any table top or shelf. Celebrate your best Instagram photos and incorporate them into your décor. Our square Canvas Lite prints are an easy way to add interest to your décor and show off your social media photos for a personalized look everyone will admire. No matter your photo, it’s guaranteed to look amazing printed on canvas! With today’s smart phones and digital cameras, capturing your favorite memories couldn’t be simpler. Keep your remembrances alive by incorporating them into your home décor. Our Canvas Lite prints are perfect for showcasing any memory and are sure to add a unique look to any room in your home. Decorate your shelves with character or give your empty side table a little personality with your cherished digital images. Perhaps you took some photos on your last vacation and you have a great photo of the family standing by your favorite tourist spot. Why not show it off on canvas. Choose a canvas size and layout to not only fit your photo but also your table, shelf or mantle where you want to display it. Your vacation photo will brighten up any nook and is sure to be a conversation starter during dinner parties or when you have guests over to your home. Whether you have a snapshot of your kids, a new baby photo or a picture of your pets, it’s guaranteed to display well no matter where you show it off. Our mini canvas prints are perfect for any gift give occasion and won’t break the bank! Upload your loved one’s favorite photo to MyPix2 and create a Canvas Lite that they’ll love displaying in their own home. There’s no better gift than a treasured memory and with our canvas prints, you can preserve a beloved photo for the perfect gift, no matter the occasion. Maybe your friend is moving into a new apartment and you want to find her a special housewarming gift to decorate her new place. Our Canvas Lite photo prints would make the perfect housewarming gift. Our custom canvas prints are a great gift idea for birthdays, weddings, anniversaries and more. Share a beloved memory with a special someone and showcase it on canvas for home décor accent everyone will love. Whether you’re looking to display a favorite photo, add a little interest to interior décor or create a fun gift for a friend or family member, our Canvas Lites are ideal for any occasion. Simply upload your favorite photo, create your own canvas print and display it on any shelf, mantle or table for year after year of enjoyment. Our Canvas Lite prints are available in six different sizes so you can display any photo and showcase it in any setting. Decorate an empty bookshelf with character, display a beloved memory on a side table or add a little color to your mantle décor with your favorite photos. Our Canvas Lites are made from a compact, flexible material so they can be set up anywhere around your home and include an easel back so you can enjoy your photo canvas print in minutes. Canvas Lites are great for boosting your décor with a little color, are easy to design and make a great gift for anyone on your shopping list. Celebrate your cherished photos on Canvas Lites and relive your best memories in style!